Finding that perfect pair of shoes can be difficult. With so many colours and styles to choose from, it can often be a case of where you do even start. 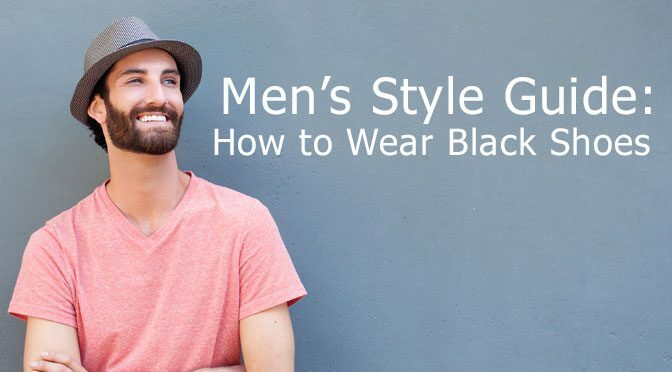 Black shoes are a versatile style option that many men resort to buying because they feel comfortable in the knowledge that black goes with a lot of outfit choices. While brown and navy shoe choices are becoming increasingly popular and on trend, black shoes remain a firm favourite with men due to their familiar nature. Today however shopping for black shoes is not as simple because the varying styles of men’s shoes mean you have more options to choose from. This can be quite daunting so we’ve put together a style guide for the modern man. We share information on the different shoe options, when you should wear black shoes, and what to wear black shoes with. You can wear black shoes all year round which is why they’re a wardrobe must have for any man. If you are thinking of wearing black shoes however you should always check the style is right for the occasion. Men’s shoes come in two categories, casual and dress. However, there are many variations within each category so let’s start off by looking at the different types of shoes you have to choose from. Boat shoes are a slip on shoe with rubber soles and a rope detailing woven around the shape of the shoe. These shoes were designed for people to work on deck but due to the popularity of nautical trends soon became a popular fashion item for men. Men’s loafers are a slip on shoe with slits at either side of the tongue, for easy access, and they have a rounded toe. These are made from leather and are often plain but may include a buckle strap decoration. Trainers for men can be made from either leather or canvas but they are a relaxed style with flat heel and often feature laces. Moccasins are very similar to loafers with their slip on style. The key difference being that moccasins are made from a variety of materials including suede and that they can feature lace or tasseled designs. They also have a flat heel whereas loafers can have a slightly raised heel. Some people may assume casual shoes should be saved for daytime and should be swapped for dress shoes in the evening. However rather than focussing on time of day, you would be better judging when to wear casual shoes by the occasion. Casual shoes suit more relaxed environments, for example going to the pub with friends, a trip to the cinema or simply running everyday errands. Oxford shoes are laced up leather shoes with a pointed toe and slight heel. They have a closed lacing system and can be quite a narrow fit. Derby shoes are often mistaken for oxford shoes as they are very similar in design. The key difference however being that derby shoes are designed as a wider fit and have an open lacing system. Men’s brogues are a low heeled leather shoe with stitching patterns on the vamp. Men’s chelsea boots are a minimal slip on ankle boot with a round toe and low heel. Monkstraps are similar to derby and oxford shoes but instead of a laced design, have a large strap over the surface of the shoe. Dress shoes are more formal so they’re better suited to work wear, restaurant dinners, interviews or weddings. They should be worn for occasions rather everyday wear. Casual black shoes can be difficult to style because unlike with dress shoes you have a lot more outfit options. Dress shoes tend to be worn predominantly with suits whereas the varying styles of casual shoes mean you could wear them with jeans, chinos and shorts. We’ve put together some outfit advice to hopefully give you a bit of inspiration when deciding what to wear. Commonly black shoes are better suited to darker denim so if you are wondering whether black shoes are ok with jeans, they are, but you should pair them with black or navy washes. Darker coloured jeans tend to naturally look dressier so they are perfect for creating an evening look. Pair them with a crisp white shirt or a black, or navy, jumper and a smarter shoe style such as Chelsea boots, brogues, derby shoes or monkstraps. This outfit choice would be perfect for a romantic dinner with your partner or drinks with friends. Don’t be scared to go for an entire black outfit or experiment with monochrome, both are simple yet stylish looks that never go out of fashion. If you want to wear black shoes with denim for a day look you should opt for boat shoes, loafers or canvas shoes and team with a casual tee. While you should still opt for darker denim with black shoes you could relax the look with coloured t-shirts and lighter jackets. Chinos are a style staple for most men as they are a versatile option that can be dressed up for a smart work look or can be dressed down for a casual occasion. The top and shoes you pair with chinos can make a huge impact on the look you are trying to achieve. A white shirt with oxford or derby shoes can smarten an outfit whereas a t-shirt and boat shoes, or loafers, can dress them down for a more casual look. When choosing to wear chinos with black shoes you might want to bear in mind the colour. Black shoes are often better suited to darker trousers shades like navy blues and burgundy’s. If you are wearing black shoes and darker chinos however, you should opt for a more subtle coloured top to avoid colour clashing. If you are ever worried about teaming coloured trousers with black shoes roll up the cuff of your trousers; exposing a little ankle can give the colours a break so they don’t clash as much. Beige, stone and grey coloured chinos also work well with black shoes but you might want to wear a darker top to make the outfit more tonal. When the warm weather hits, shorts are not an uncommon outfit choice. However pairing them with footwear can be difficult as apart from the obvious flip flop association many men are unsure about what works well together. The type of shoe you wear however will depend on the style of your short so let’s look at a few outfit combinations. Jersey shorts are often worn around the house, on the way to the gym or when spending those chilled afternoons with friends. This look is all about comfort so jersey shorts are best teamed with trainers. Black trainers are very popular for men at the moment and you normally have the choice between a completely black style or a black and white combination shoe. Chino shorts are a smarter day short that can be worn for various occasions. Whether you choose to wear them for running errands or a trip to the local pub, chino shorts are both a sophisticated yet casual outfit choice. Your shoe choice for these shorts can also be versatile – boat shoes or moccasins would help to smarten the look but if you wanted to dress them down, team with men’s canvas shoes or trainers. Just bear in mind the colour combinations when teaming chino shorts with black shoes – the general rule of thumb is darker colour look great with black shoes while lighter shades may clash. Tailored shorts are relatively formal and they are often worn as an alternative to smart trousers. These shorts are perfect for warmer days in the office but because the nature of this look is smart, you need to choose your shoes more wisely. We recommend you team them with oxford shoes or brogues. Socks can look odd with these shoes so either wear without or opt for shoe liners (invisible socks). Denim shorts are like chino shorts and can be worn as a smarter or more casual option. This will depend on the top you wear with them and the fade of denim. If you wanted to dress them down however canvas shoes or trainers would be recommended, but to dress up the look opt for boat shoes. Black dress shoes are more often than not paired with a suit but there are certain rules to remember when selecting your outfit. For more formal occasions like business meetings and interviews, you need to choose a smarter dress shoe. Oxford shoes and derby shoes are the most classic design, although if you’re going to be wearing these shoes all day everyday you might be better opting for the wider fit which is a derby shoe. Oxford shoes are narrower in design and while they look the part, they can take a while to wear in. There are certain rules you need to follow when pairing black shoes with a suit. Navy, light grey, charcoal and black suits all fit well with a black shoe. Brown suits and black shoes should be avoided at all costs. Black shoes are certainly the most versatile shoe option so if you have various suit styles and you’re looking for a shoe to go with them all, black shoes would be the better investment. Oxford and derby shoes tend to have intricate stitched detailing so outfits paired with these should be kept quite simple. A plain shirt and suit would be the best way of styling these particular shoes. Another workwear option to go with your suit choice would be the monkstrap shoe. As monkstraps have their own design these would also be best suited with a simpler outfit. These look particularly great when paired with a turtle neck jumper, suit jacket and ankle grazer trousers. For those special occasions like your wedding the most traditional shoe choice would be the oxford shoe. This is a more sophisticated style and pairs well with a tuxedo. Oxford shoes have their own design variations, the vamp of the shoe can be both patterned and plain so how you wear them is completely up to you and your personal tastes. Patent leather shoes have a glossy coat creating a high shine finish and so they are quite the statement shoe. These should only be worn with suits or tuxedos and should be paired with a simple black suit or tuxedo. As the shoe is quite bold, it would be best to tone down the outfit and keep it quite classic. Patent leather shoes are often more of an occasion shoe and should be saved for special events like weddings and seasonal parties. Everyone needs at least one pair of black shoes in their wardrobe as they are a reliable staple that can go with most outfits. It is recommended you own a casual pair of black shoes as well as a dress shoe to ensure you have something for every occasion. Black shoes can be worn with shorts, chinos, jeans or suits providing you choose the right style and colour. Dress shoes are a more formal shoe and should be worn for work or for occasions like weddings, whereas casual shoes can be worn for everyday events. Black shoes go with various coloured trousers but they are best paired with light neutral colours, like stone and grey, or bolder dark colours, like burgundy and navy. While black shoes can go with some lighter spring colours like greens and mustards, this can be quite a quirky style and some men will feel uncomfortable making this match. If you’re ever unsure however black on black or black and white is a classic trend that will never go out of fashion.